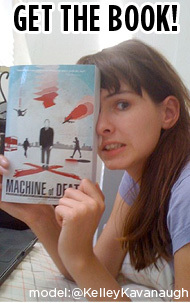 Machine of Death » Almost done. Vol2 Updates 04 Nov 2011 11:42 pm by David ! Oh, oh I second the themed collections idea. Alternately, short collections where the titular cause of death is the same; these might need to be quite small, more pamphlet than novel, to keep from dragging, but it would be interesting to read 5-8 different stories in the theme of “DROWNED,” for instance. I agree on all points with this one. As long as there are enough good stories on single themes (and with what I’ve been reading from what people have put out as far as rejected stories on Twitter and such), this could be a really fantastic idea. Also, I know I can’t be the only one who really didn’t give a flip about the money in the first place (although I do understand wanting to do right by your authors of course). As far as AproposPenguin’s suggestion, I think I’ve read three or four stories titled METEOR so far (actually, I think one was ASTEROID, but the concept was similar), so I’m sure that’s a definite possibility. I guess the question remains — how much further do you guys want to go on this? I’m almost sure the vision isn’t really to pluck another full volume from the submissions you already have, but given that you’ve just probably spent an exhausting few months sifting through stories, how much is too much to ask? And if it comes down to it, is there anything the community can do to help? I’ve always been fascinated by the idea of “micro-art” – a play put on for only one person ever to see, a painting hidden somewhere, a piece of music composed for one occasion and never performed again. How about having one or two stories set aside as, say, prizes for a contest? The winner gets the story, printed on fancy paper, signed by the author and the publishers. Still under the same license, so they’re free to put it up on a Web site should they so desire, or just keep in the bookshelf, or read aloud at a poetry happening, or whatever takes their fancy. Well, the list is on Mad Art Lab, which belongs to @surlyamy. I’m just one of the minions. With the qualification that I have no comprehension of the logistics (not the mention the potential or lack thereof for profits) behind such a thing, a podcast magazine sounds fantastic to me. I have a a question, and an idea. First, If I publish my stories on my blog, will that in any way affect their chances of being considered for future projects? Second, have you considered some sort of audience selected anthology, where you post stories and let the readers vote on which to include. I think it would be fascinating to see which stories come out on top in a different arena. Yeah, I’d like to know the answer to the blog question as well. I too find this question to be of importance. I could envision a very cool smartphone/tablet app for the Machine of Death. It would basically generate a random “death slip” and the story that coincides with that title. That said, I know next to nothing about the logistics of such an app, but I can at least see it being cool in my head. 1) I do like the idea of some “reader’s choice” awards. List 4-5 per month and let readers pick. Then a quarterly ebook, fer cheap, as in 99 cents. Small token payment, this is more about bragging rights. 2) In the 6% that made it to the “one-potato, two-potato” round and the 21% that made it to the “on the table” round you have an embarrassment of riches that while they may have not fit the overall theme and mood of the anthology, could be perfect for monthly or quarterly ebooks – either free or 99 cents. Enlist some of the masses to act as guest editors and let the also-rans out to play. I don’t think anyone would get tired of MOD – I think it would bring more readers into the fold. Save the print edition and the podcasts for the winners. They are the royalty and the deserve it. However, you also have a tiger by the tail and the more exposure it gets, the more likelihood for a big pub house or a film co to take notice. What about a quarterly newsletter on the book project? Something way smaller and cheaper than McSweeneys, but same concept – we could pay to subscribe and it would come with a few teaser stories and art, and an update / insider’s guide to the progress and process on the book. Shorter, themed collections sound pretty dang amazing. Even as an audiobook series, rather than print. Allow people to subscribe or buy individual albums to get the collection all at once, or they can wait until all of the individual stories are released on the podcast. What about the illustrators? Have they been picked yet? Yes yes, whither the Illustrators? What’s the situation with the emails that haven’t gone out yet? Did they just fall through the cracks yesterday or are you still making some decisions? I’m wondering the same. I fully expect rejection but want to see the letter everyone else got. A podcast magazine is a fantastic idea! At a story per week, your pool of stories should last a long, long time. You could go through the stories that have already been bought and paid for first, to lower initial costs and drum up interest in the current anthology. Even when buying new stories, the payment could be lower, as it could just be the audio rights… but the bragging rights would still be excellent. That is an ungodly amount of work to put into the also-rans. Any word on the illustrators, though? With the ease of e-publication these days, what about a monthly e-zine. Maybe two stories a month, ebook only, for 99c – put it out through Kindle and Smashwords, and you get very wide market penetration and formats to suit all devices. You could pay a lower rate for the stories, but still pay (naturally – we’ve all got to eat!) and hopefully the MOD reputation would drive sales. That way MOD fans get a couple of stories every month and the MOD bandwagon rolls on. This is the best, most sensible and most cost-effective use of the material. One more key component. Recruit some guest editors from different themes and let them put it together. That way the work is spread out (fits in with your crowdsource philosophy) and there is some variety of voice and interpretation of the premise (ie – I personally like less character angst and more plot-driven action with an actual playing out of the death prediction). I’ve been in a couple of collections like that and they are awesome good fun. Is there a way of knowing how far into the selection process your story made it? Did it say in the email? I feel like that might determine what people should do with their stories (either post it on a blog themselves or wait and gamble that the MOD dudes decide to do something with it). As far as I can tell, they only let you know if your story made it to the very last round of the selection process. Thanks for the shoutout! We’ve got a few stories, but the queue is getting low. Send us more! More books please. It seems like the idea definitely still has legs, and I will keep submitting so long as submissions are being had. That being said, genre mini-books would also be nice. Sci-Fi, Fantasy, Historical Fiction, Action, Romance, whatever. But please, please, keep releasing physical volumes. Don’t contribute to the downfall of print! I agree, I would rather have a physical copy than an electronic copy, even counting the added price I have to pay for shipping and stuff. According to Wondermark, the simultaneous “Classy Photo Contest” winner will be announced later this week. Perhaps the MOD Evidence contest will suffer a similar fate? If we didn’t get an email by November 8th and we sent a query, how long should we wait until we assume that we got lost in that pile? I’m sure this is a lot of work for three people, so I’m not trying to rush or anything. I just have this paranoia that my story never landed in the first place. Just wanna state how glad I am that someone else hasn’t gotten a response yet either. Though it’s still veeery early after the deadline and judging by how many emails they got through in record time, shouldn’t be long at all! I’d like to see a User-Voted book featuring what we, the readers considered the best of the rejects. Like, Expand the site—or even use the tumblr site— post the rejected stories, and, after a year of people thumb-upping or thumb-downing stories, take some of the most liked stories and make a volume out of them. Or a Graphic Novel collection, featuring comic-formatted stories only.